A number of French families who happen to have the same surname as the Paris terrorists – Kouachi and Coulibaly – have been harassed, with some receiving death threats and insulting calls in the middle of the night, local media report. Entire families have become prisoners of their surnames in France. "I say it over and over again, my husband's name is Amedy Coulibaly, like the terrorist's, but we do not know him, we are not from the same family," Mme Coulibaly tirelessly repeats over the phone to Le Figaro. "We have nothing to do with him," the woman says. Since the attack on Charlie Hebdo magazine and the violence that followed resulting in 17 deaths, her family, originally from Mauritania, has received dozens of threatening calls – sometimes in the middle of the night, around three in the morning. "People call, but when the call is answered there's no one on the other end, silence, and it's very scary," the mother of four says. Her husband has reported the harassment to police. In Indre-et-Loire department in west-central France, another housewife is fearful. "Yes, we've got the same name as the Kouachi brothers, but that's all, we have nothing to do with them," she exclaims. Her children were harassed at school, she tells the newspaper. "Others began to insult them, they treated my son like a terrorist in high school, the same happened to my daughter in middle school," she said. "It's been tough for us ever since. At some point we even thought of changing our last name." At Tours, a city in central France, a 70-year-old pensioner with the last name Kouachi, has also been subjected to the ordeal. "Idiots called to insult us. They must have discovered our name in the phone book,” he said. Although the calls have calmed down, the old man is still a bundle of nerves. "We are Muslim, I frequently go to a mosque and I fear that people will lash out at us," he told Le Figaro. "You know, even my little granddaughter is scared. Yesterday morning I went to meet her after her lessons and she told me 'Grandpa, do not say hello to me in Arabic in front of school." In the Languedoc Roussillon region in the South of France, another Kouachi family has also been suffering the consequences of the attacks. "It was a shock for me to see my name appear repeatedly on television for days and days," a 48-year-old woman, who declined to give her first name for security reasons, says. "My sister has received death threats and has not slept at her house for a few days; I don't want the same thing to happen to me," she says. She says she was insulted with embarrassing jokes, with people saying: “Call your brothers and tell them to surrender.” Now her nephew wants to change his name and her sister is afraid of not finding a permanent job. Her brothers fear their craft business will die. A Paris prosecutor, Francois Molins, said on Wednesday that four men, with ties to one of the gunmen responsible for three days of terror in and around Paris, were preliminarily charged with association with terrorism, and were jailed pending further investigation. They are suspected of providing logistical support to Amedy Coulibaly, who shot a policewoman dead on the outskirts of Paris and killed four hostages at a kosher supermarket. 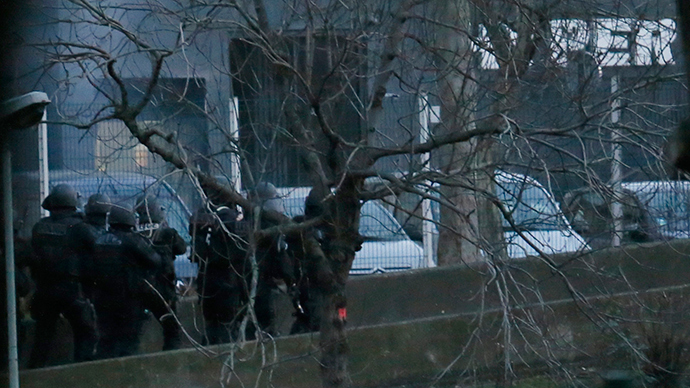 One of the gunmen behind the Charlie Hebdo attack, Said Kouachi, was buried last week in an unmarked grave in the city of Reims, northeast France. There were several family members present, AFP reported, citing a well-informed source. His younger brother, Cherif Kouachi, was also buried in an unmarked grave near in the northwest suburbs of Paris under tight security to avoid it becoming a "pilgrimage site" for Islamists, authorities said. No relatives attended the funeral at the cemetery at Gennevilliers. There has been no announcement on plans for burying Coulibaly.